The Feubo C Connector is often used in Mooring Systems. 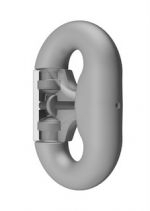 This Mooring Connector is also classified as a Chain Connector Link or Chain Accessories. Supplied with DNV Certification as standard.